Latex soles for felt slippers, cold spell continues and Happy New Year! Last night I decided not to light my wood burning stove first thing this morning and try to get some household chores out of the way as a less expensive way of keeping myself warm! Needless to say it wasn’t long before I decided on a little textile diversion and in the continuing absense of water had a go at painting latex on the soles of some warm felt slippers which I had made for myself earlier in the year. Those of you who are regular readers of this blog will realise it is these little finishing touches that I find very difficult to get out of the way, add in a touch of sewing and they really are my worst nightmare come to life! Anyway, I made the slippers last spring using some gorgeous gotland (which someone has now told me might shrink further as I wear them) and I had promised myself that I wouldn’t wear them until I had added a latex sole for extra durability and waterproofing qualities. They also need one stitch at the back of each heel, this is to hold the tongue of felt (just visible in the picture) into a nice decorative curl, somewhat Turkish looking is what I am aiming for. I havn’t used latex before but believe that I need to paint about 5 layers to achieve a really good sole, Tone from Ullform in Norway also said that she sprinkles a layer of ground maize (hope I have that right!) over the final coat and that this adds quite a bit of grip to the bottom of the sole. The heavy wind and rain from yesterday has finally abated, now we just have sleet here and snow on the mountains surrounding Clasheen. Thankfully I managed to speak to the friend who services my Rayburn and he gave me a couple of tests to carry out which indicates that my central heating system is actually working. I still don’t have any heat in the rads however but have now got a man organised to check the pump in the well tomorrow morning so hopefully if we can get the water going and the pressure tank up and running things might get back to normal soon. I can only keep my fingers crossed! Obviously from all the messages that I am receiving many of you from all over the world have your own weather difficulties, some actually having drought and excessive temperatures, the exact opposite to what we are having here. It is nice to feel part of a wider community although obviously I would prefer if no-one had any problems in the weather department at all! Finally I would like to wish everyone a happy and peaceful New Year. Enjoy any festivities that you have planned for this evening and hopefully we will all have a fantastic time felting and enjoying our various art practices throughout 2010! 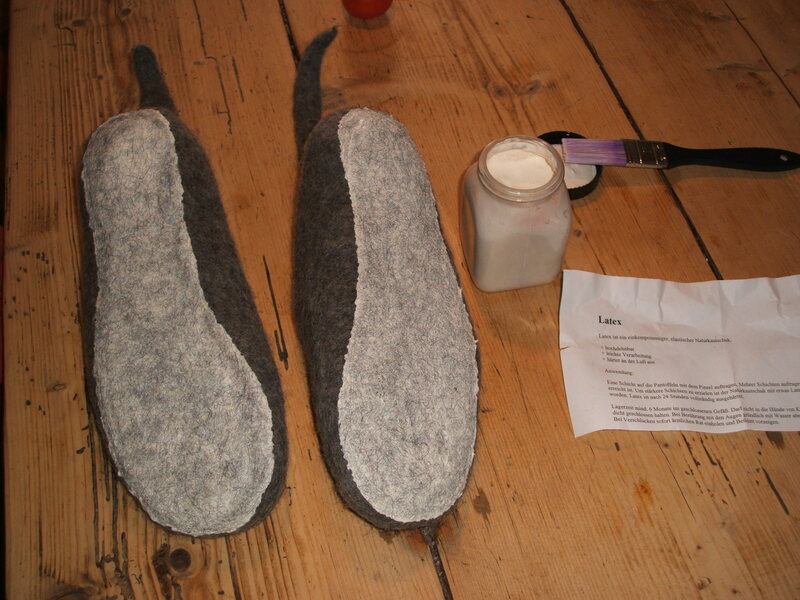 This entry was posted in Felt and tagged Clasheen, Felt, felt slippers, Felting, latex, latex sole, New Year, sew, sewing, slippers, snow, stitch, weather by Nicola. Bookmark the permalink. Happy New Year Nicola!!! And I hope part of that happiness begins today with your your water being restored. Oh, and by the way, I can totally relate to all of your woes when it comes to those dog-gone finishing details. It’s about been my un-doing a few times, and sewing, well I’d better not even think about that. Even with my reading glasses, I have the hardest time threading those pesky needles! Thanks so much for all of the great posts throughout the year…You’re a gift!